Ok boys and girls, it’s time for What’s Next Blog’s semi-annual count of self-proclaimed social media gurus, ninjas, stars and specialists. We find that the tide has ever so slightly slowed – perhaps because of the derision heaped on said gurus by legions of bloggers – including this one – and this infamous (hilarious) YouTube sendup. Back in January 2010, the social media guru brigade was multiplying like rabbits, causing one reader to quip that within three years, everyone on Twitter would be a social media guru. 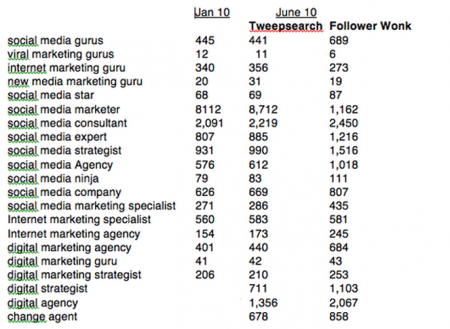 We expanded our search to include both Tweepsearch and Follower Wonk, which search the bios of Tweeters for keywords. While our total gurus et al was 15,740 six months ago, it is now 17,283 according to Tweepsearch and 12,698 according to Follower Wonk. The count for those experts has yet to reach the hundreds. I’m a Seahorse: I like to think about myself as a stallion, but I’m just a little fish. Definitely low ninjutsu levels in my blood. That the ranks of “experts” are in the millions is no surprise, though I’d be very surprised to find the “real deal” practitioners only in the hundreds, simply by virtue of the vast scope and number of users. I just started to think to be a social media guru as well! 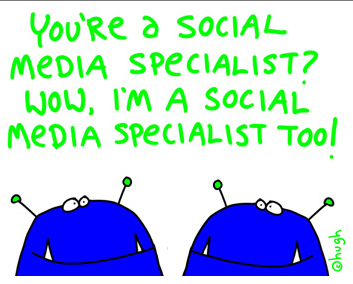 Are the companies investing in social media consultancy? A few years ago, a friend began to get irked about all the people who were proclaiming themselves to be search engine optimization experts. This guy was my SEO, and he had one of my sites ranked #1 in Google for several years. But he got so tired of all the expert hype that he started calling himself an “egg-spurt.” Not on his website, mind you, but in his monthly client e-zine. I used to treasure those issues. Now, before you get all excited and start asking me for referrals, I’ll have to let you in on some sad news. My friend died in his sleep back in January 2006. I still grieve this loss. William was a friend of mine too, and one of the best kind of people. Hey, that’s an ugly table conveying not much info! I suppose it would help if this old DOS geek had a clue about the column headings though. I suppose everybody imagines that they are a social media guru just like everybody imagines that they are superior in bed? Seems like a non news comment, though a decline in the acceleration of growth would actually be the true news. I quoted your blog here: http://hotel.jeroenschouten.com/?p=30 Thanks for the article, much fun!